What is a Database or Digital Resource? The definition of a database is a structured collection of records or data that is stored in a computer system. It is a searchable, computerized file, often of periodical indexes that can be authenticated. A digital resource includes a database but also e-books, e-news, audio books, videos or any other digitized source used for research or information. With restored funding from the state legislature, the Texas State Library and Archives Commission (TSLAC) is re-establishing the statewide databases program for K-12 public schools in connection with Gale Cengage and others. This new program is called TexQuest. 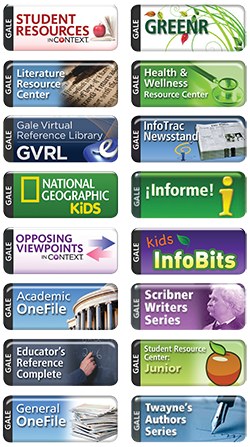 Click image to the left to enter all the Gale Cengage databases. There are 20 of them! Get the TexQuest Gale Cengage Database App! Go to your app store and type in Access My Library, Click Install, Open, Choose AML School, Choose Dayton H S, ask your librarian for the password, and now you can search. Welcome to Britannica School: a safe, up-to-date, and age-appropriate information resource of online multi-level encyclopedias for elementary, middle, and high school. Book and Author Resources-Make books come alive! For Staff Only: Discovery Education Streaming Plus integrates seamlessly into any curriculum with over 9,000 full-length videos segmented into 71,000 content-specific clips tied directly to state standards. It can also measure student achievement and train educators. Please email me at dani.nations@daytonisd.net for our school's Passcode.